Oh for the love of Pinterest! How is it possible to spend so much time just browsing and 'pinning' pretty pictures? 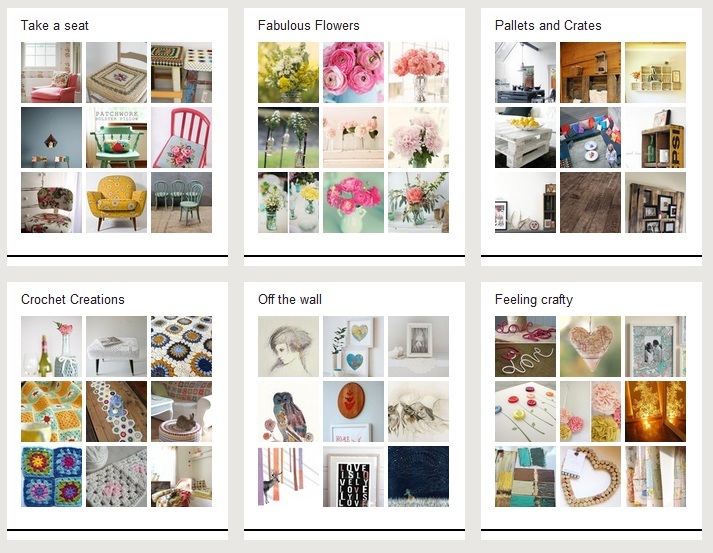 Pinterest is great because it combines my two loves of looking at pretty pictures and organising! It is so addictive. I can literally spend hours of a quiet evening updating my boards. But I do like to think it's somewhat productive in a way. Before, I had acres of bookmarks of pictures and projects which were so disorganised and higgledy piggledy I almost never looked at them, or folders on my computer where you inevitably forget where the images came from. Now, whenever I have a project in mind or need inspiration, I know exactly where to go - my boards! The only problem is, I've been doing so much home decor pinning lately, I am just dying to do some decorating myself. Living in rented flats, I can't really indulge this desire too much unfortunately. But I do have a few wee ideas for projects coming up to satisfy the decorating urge. And of course once I get my Ixxi up in my bedroom, I'm planning on working a whole new soft furnishings colour scheme to match, so some fun crocheting lies ahead! While I'm on the subject of inspirational pretty pictures, I have to mention how much I've gotten into Flickr lately as well (I know - where have I been?). I was delighted to discover the 'Granny chic' group (and even more delighted that my pics were accepted to it!). It's lovely to find so many people who share the love for the Granny aesthetic. So I'm looking forward to sharing my future finds with people who won't think I'm a weirdo for buying second hand doilies etc. So far I've decided to give Tumblr a miss because if I have another website to browse and update I'll never get anything else done! flickr rules, tumblr is good too - I've been trying to get into pinterest as you can see, but it's just not clicking!